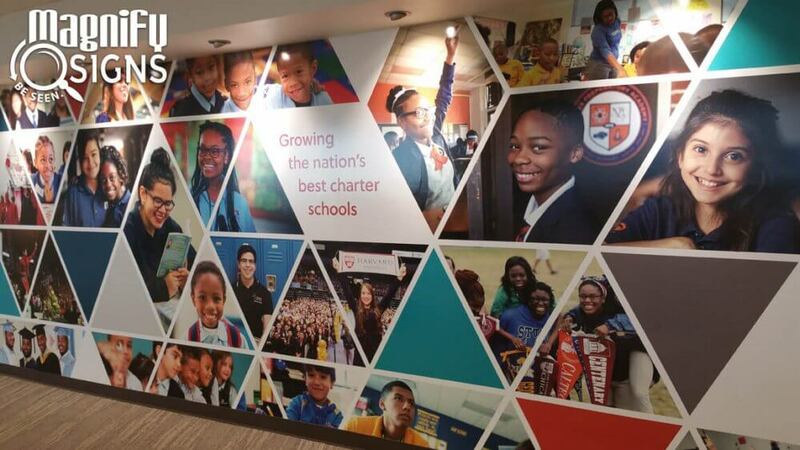 Magnify Signs provides expert signage services for businesses, schools, and non-profit organizations located in Colorado and throughout Denver. We’re dedicated to helping businesses and organizations of all types and sizes ‘Be Seen’ with exceptional indoor and outdoor signs. At Magnify Signs, we’re not just another signage company – we’re sales and marketing professionals that use our 30 years of expertise to assist your business with proper signage solutions. Our success comes from creating effective, branded signage that impresses customers, increases foot traffic, and drives sales. Our team has the knowledge, skill, and experience required to create the perfect custom signs for your needs. Just tell us about your needs, goals, branding, and where you’d like your sign to be installed – and we’ll take care of the rest. Every business strives to put forth a friendly, clean, and clear image for their customers. Quality signage is the most cost-effective way to improve your image. Whether you need lobby signs, window graphics, vehicle wraps, outdoor signs or any other signage, we can design, create, and install the right solution for your business. We focus on our customers’ needs and design signage solutions that will meet (and exceed!) your expectations. We combine great ideas, great service, and great value to create exceptional signage and graphics. Just read our customer reviews to discover how we’ve helped customers in a variety of industries achieve their signage goals. Let our team provide your business with a complimentary onsite signage to discover marketing solutions that will positively impact the growth of your business. Magnify Signs utilizes the latest HP technology large-format latex printing equipment to create color graphics for walls, windows, vehicles, and many other applications. The advanced print and color matching technologies allow us to achieve a broad spectrum of colors, so we can always match your brand colors. 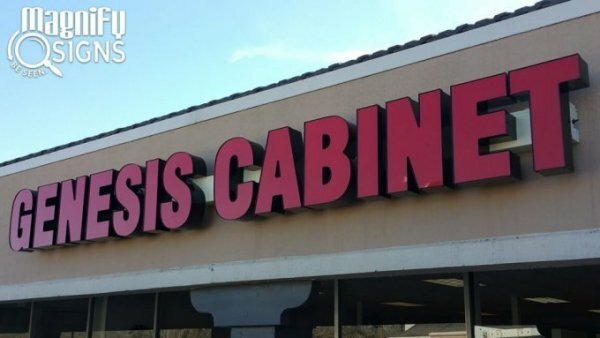 And if you need advice, our designers are experts at helping you determine the best colors to help your signage ‘Be Seen’ by your target audience. 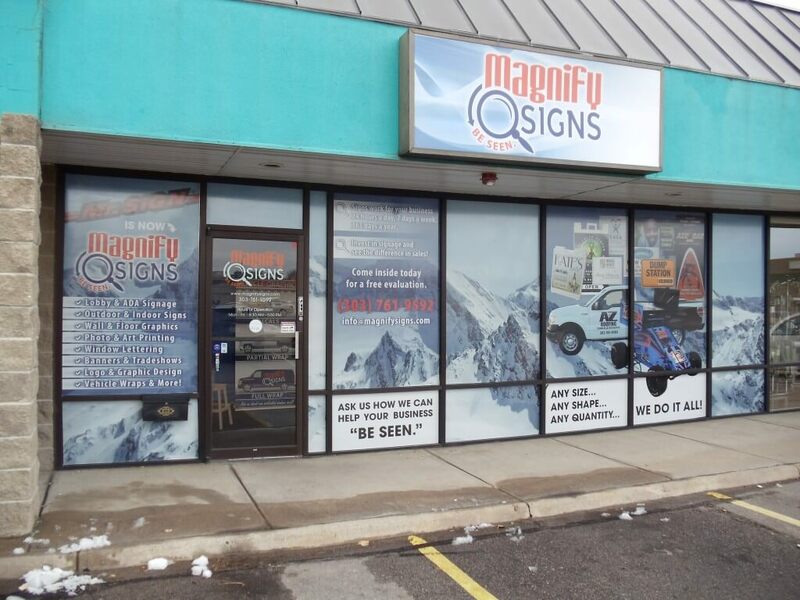 Magnify Signs is a full-service signage provider. We’ll work with you to design and create your custom sign, and professionally install it for a long-lasting result. As an experienced sign company, we’ll ensure that your new sign is compliant with local and federal laws (such as ADA compliance). And if your sign requires a permit, we’ll do the work to obtain the necessary paperwork before its installation. What’s more, if your sign requires repair or routine maintenance, our team is ready to help. From replacing a burnt-out bulb to installing a new sign face, we’ll have your sign looking as good as new. With our 30 years of industry experience, we have the expertise to create every kind of custom sign you need. We’ve worked with hundreds of satisfied clients to design, create, and install custom indoor and outdoor signs to support their businesses. Take a look at our portfolio to learn more about our work and see the quality for yourself. Make Magnify Signs your local signage partner to support your business or organization with high-quality, custom signs.